On the eve of the 1986 summer solstice, friends Larry Harvey and Jerry James decided to build a small figurine out of twigs and branches, and set it ablaze on one of the beaches of San Francisco. The impromptu bonfire drew in nearly 200 curious bystanders. Today that number has grown tremendously. This last year over 69,000 people came together to celebrate the annual Burning Man Festival. The celebration has transformed itself from a once small, seemingly insignificant event into the creation of an entire community dedicated to improving the self and others through art and separation from typical society. Values which the organizers measure annually by surveying participants and reporting metrics on their personal growth. The participants each year are left for eight days to create a society for themselves—called Black Rock City—where each festival goer is meant to learn self-reliance, self-expression and a dedication to the community built in the Nevada dust. Participants can create or be involved in art installments, theme camps, creations of mutant vehicles or performances of various types. Each year these installations revolve around a theme. The 2018 festival’s theme is iRobot. This year’s festival was centered around ideas of artificial intelligence and the society that has been created, or could be, through the world of technology. The idea is said to have come from co-creator, Larry Harvey, when he repeatedly received automated voice messages from solicitors. Besides the traditional burning of the now over 100 foot man the highlights of the festival are the other sculptures and art installations that find their home at Burning Man. Artists and members of the community work on these pieces, using them as a tangible site of what they may have achieved at the festival for themselves and others. 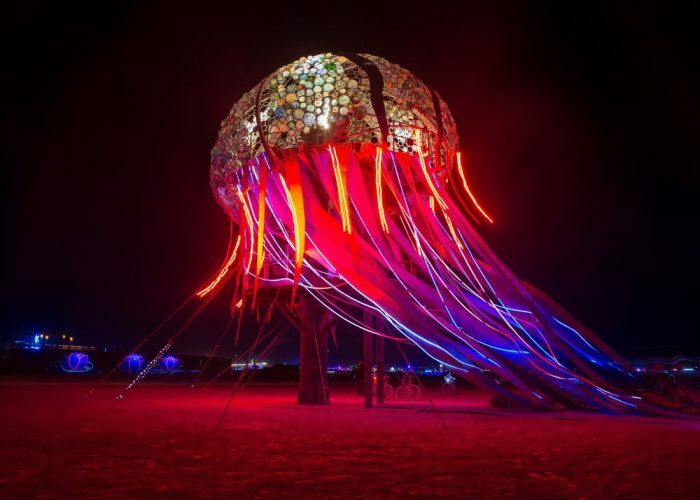 One of this year’s installations was Bloom, a 40 foot illuminated jellyfish that was also presented at the 2017 festival. The piece is made to be interactive so that participants may be able to crawl up into the dome of the jellyfish and look out onto the landscape. “Bloom,” a 40 foot art installation looms over guests at the 2018 Burning Man festival. The art created through Burning Man is meant to stand for what the festival claims to be. It is meant to create an environment that inspires thought and action that may not be the default, like how Bloom inspires participants to reflect on the community and work for being able to do so. The Festival concluded Sept. 3, 2018, with a traditional fire echoing that which opened the event. This year’s community was considered just as successful and fulfilling to the participants as it has been in years past. Photos courtesy of Laurence Symonds and Peter Hazel.